Early Saturday morning, after two train rides, a stint on the London Underground, and a night spent trying/failing to sleep on a wooden bench in London Stansted, I finally arrived in Kraków, Poland for a weekend trip in what is probably one of the less obvious tourist destinations for someone with all of Europe just a quick flight away. But, being part Polish, I’d always wanted to go, so I grabbed a couple of friends and we went. And it was so much better than any of us had expected. I knew visiting Poland would be nice just because of my ancestral ties to the place, but as it turns out, Kraków is just a lovely place to visit in general. Even though we were only there for a weekend, I’m probably going to have to write a few posts to cover everything – the food and drink we found definitely deserves its own post, as does our day trip to Auschwitz, and our hostel and other practical stuff probably does as well, so those posts will come in the next couple of days. If you read all of these posts, I fully expect you to book a holiday to Kraków immediately. Honestly. It’s that good. And it’s super, super cheap, so there’s really no reason not to go, especially if you’re already planning to be in Europe. If you do find yourself in the former Polish capital, your best bet tourism-wise is to immerse yourself in the history of the city. Unlike Warsaw, Kraków escaped World War II largely unscathed – from the window of our hostel, we could see the beautiful 14th-century Baszyika Mariacki and the 12th-century Rynek Główny. After exploring this immediate area, we spent our second day around Wawel Hill, home to the castle where Polish royalty lived until the 16th century (a lot of the original artwork is still inside and let me tell you, Poles really appreciate tapestries in which mythological figures beat the living hell out of each other) and the 14th-century cathedral where Pope John Paul II presided as Archbishop of Kraków. We also wandered over to Kazimierz, the historically Jewish quarter, which has just recently experienced a resurgence of Jewish culture, 70 years after the district’s Jewish population was forcibly moved to the Kraków Ghetto. To be honest, much of the area still looks pretty bleak, but we’d heard that there was really good food to be found, and that definitely turned out to be true, as I’ll mention in my next post. Much like when I was in Bath and at Stonehenge, I was just blown away by the history around me. The architecture and art here are just unlike anything you’ll find in the States. So I guess I should probably quit word vomiting and do a photo dump of some of my favorite sights. 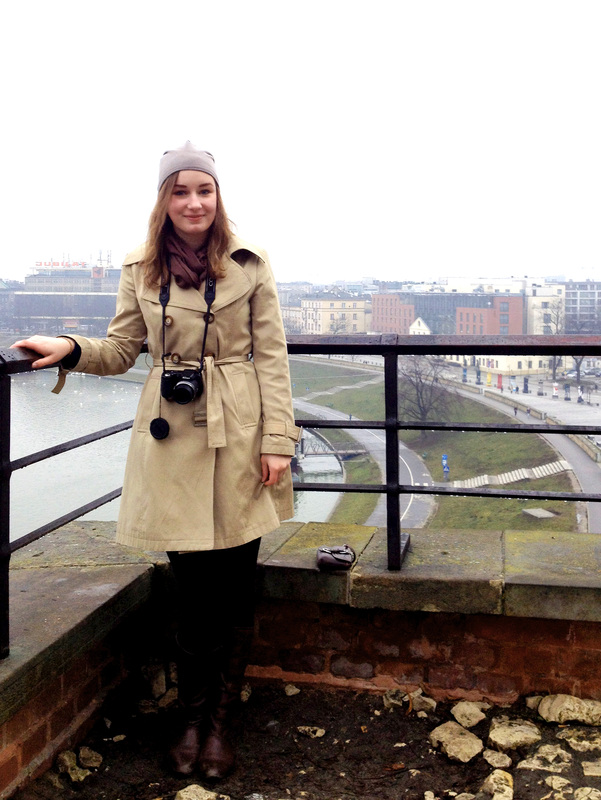 On the grounds of Wawel Hill, high above the Vistula River (and the whole city). Katedra na Wawelu – the cathedral on Wawel Hill. Królewski Dzwon Zygmunt – the Royal Sigismund Bell in the Wawel Cathedral bell tower. The audio tour that I shelled out 7 extra zloty for told me that it takes twelve men to ring this thing. Twelve. And Poles aren’t the most diminutive people. Plus, legend has it that if you make a wish while holding the clapper, it’ll come true – so I guess I’ll be getting into grad school! The Wawel Castle courtyard. Sadly, photos were not permitted inside the castle exhibits and guards did their best to enforce that rule by authoritatively yelling at us in Polish when we violated it. We might have only known a handful of Polish words, but they definitely got their point across. Learned just how lacking in upper body strength I am after it took three attempts before I successfully climbed up onto this rock to get a picture with the sculpture of the dragon that lived in Smocza Jama, a cave in Wawel Hill, according to Polish legend. Apparently the sculpture usually breathes fire on the regs, but it was rainy when we were there so we didn’t get to witness that. Rynek Główny in the rain. Bazylika Mariacki (left) and the 10th-century Kościół św. Wojciecha. Every hour, the Basilica tower sounds a trumpet signal that stops partway through to memorialize a 13th-century trumpeter that was shot in the throat while using the signal to alert the city of an advancing Mongol attack. Morbid, I guess, but pretty cool. Later this week: where to eat (and drink) in Kraków, a review of our fabulous hostel, and what will be a totally inadequate attempt to put a visit to Auschwitz into words. I wish we’d had time to go to the salt mines on this trip! I’m hoping to go back to Kraków in a couple of months, and if that works out, that tour will certainly be on my agenda. Going in a few weeks.did you do any of the free walking tours. Looking forward to hearing about Auschwitz. We didn’t do any of the free walking tours, no – just kind of explored on our own. I have heard great things about the tours (especially the ones through FreeWalkingTour.com), though, so it definitely would be a good thing to look into! Thanks. Will give them a go. RG in the rain is a really lovely picture. I think I would enjoy Poland immensely.